I had fun beating the first level! Maybe add support for touch controls so people can play on tablets? blockcillin - a free and open source puzzle game for the web! Let me know if you need any music! 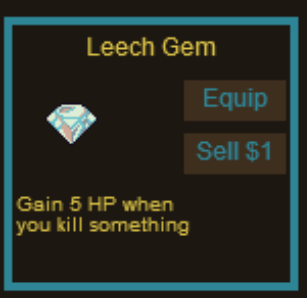 I just added a new skill gem named a Leech Gem. If you equip it, you will gain HP when you kill enemies with your projectile. Thanks a lot btmura. If it's not too much prying, what made you stop playing? Will do! I'll keep you in mind because I did like the sound of your stuff. Thanks again. I just stopped playing, because it was past my bedtime. 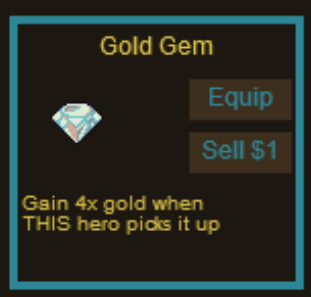 I added a new type of Skill Gem that multiplies your gold. That's really kind of you to say. It made my day! BTW, if anyone can think of some cool ideas for skill gems I'm always open to suggestions. I'm thinking of cutting the elemental concept. Visualizing the effect on the player, I think it would just make them have to do a lot of swapping of skill gems between levels. That type of micromanagement just seems tedious to me. Refer to my major todos section at the top if you're not sure what I'm talking about. What if you could get power up to change your formation rather than just walking in a line all the time? Also it might be nice to expand the screen to take the whole browser window. The game seems very complete already, and it's quite addictive! Good job! I added a freeze gem and replaced it with the freeze ray weapon. The reason I did this is freeze rays always have 0 DPS so they would always be sorted to the bottom of the list of weapons. I suspect nobody would ever think to use it for this reason. But now you can augment any weapon to give it a freeze effect but you sacrifice its damage. Nice, thanks for trying it. I appreciate all feedback. What made you stop at level 5? How do you decide who goes where? How would I design levels around this possibility to make sure you can navigate without bumping into walls? With a single file line, I can make narrow gaps you can fit in, but if you're a wide V formation, you'd probably hit the sides with some heroes when trying to squeeze through. I think something I could make work is a double line formation (as opposed to the current single line formation), but I'm not sure if that would be much more fun. Also it still has to deal with that first issue. What formation types were you thinking of? Maybe you're thinking of something I haven't considered yet. Hrm, this comment really concerns me. The game should be filling most of the browser window. You might have a white margin on the left/right of the screen, but not much. Is this what you're experiencing? Are you saying I should fill up that white margin? If you're experiencing something else, could you show me a screenshot of what you see? What browser are you using? Also, what is your browser URL when you're playing? It should be something like http://chainofheroes.appspot.com/src/main/generated/chainofheroes.html?20140625_124759 If it's something else, it would indicate to me you're somehow playing on an older version of the game. Thanks a lot! I appreciate the feedback. Comments like this keep me going. 1. 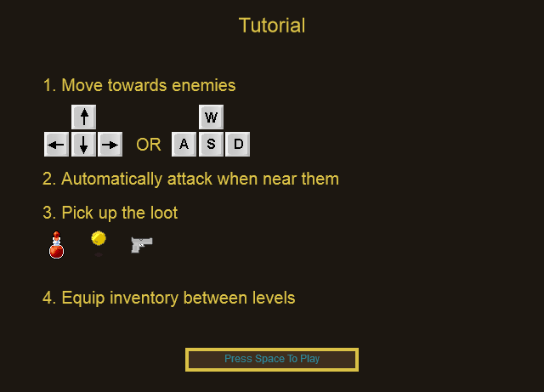 I was getting a lot of indirect (and direct) feedback that level 5 was way too difficult, so I've made that easier. I hope that keeps people playing for longer. 3. Now the weapon types have more variety. Tri-shot has shorter range, homing missile tracks better but moves slower, homing nuke has a smaller explosion radius, etc. 4. Now the homing nukes don't explode until after a certain period of time. Before that, they could explode on contact. I changed this because I didn't want the Skeletons (aka Nukers) to be able to surprise you with an instant death if you didn't know what's coming. Now that they don't explode on contact, it gives you time for your party to run away. I guess it's kind of subtle (perhaps I should highlight the changes?). If you notice, it's equipping the best weapons and skill gems of the type you're already using. You'll see the weapon damage of each character increases after you confirm that dialog. To get this working I had to implement the ability to have modal dialogs. This opens the door to a lot of other important features like adding sound. I want to make sure you can configure sound volume and can mute it before I put it in the game. That configuration dialog will probably be a modal dialog. Just finished dungeon 11, very fun game! 1) It might be easier to have a DPS stat, because I don't fully understand the time/damage ratio. I am testing different weapons, and a description or stat might make it easier to know which to choose. 4) Maybe you could tune a way to have 360 shooting (or maybe I haven't found a gem/weapon that does?). Maybe it goes against the idea of the game though, just thought I would toss that out. 5)Do you plan on implementing random names/allow for people to name their heroes? Overall, it is a lot of fun! Don't stop working on it, I like the concept. I hope you don't mind if I post just to subscribe. Thank you very much, I appreciate that. What made you decide to stop playing? What would need to change to keep you playing? Are you referring to the Equip Weapon screen? Actually that is showing DPS and sorted by DPS, it's just under a label titled "Damage". Really, it's a space issue. I don't know how to fit "Damage Per Second" in there and I think a lot of people won't know what DPS means. But I see your point. "Damage" isn't just misleading, it's kind of a lie. Let me know if you have any suggestions with that. This will definitely be possible at some point. But it's a maintenance nightmare. Once I start storing the data, then I'll have to migrate it between versions of the game. Good idea. I'll either do that as a separate button, or a checkbox to "Sell unequipped items" in the Auto Equip dialog. Great idea. I can do it as a skill gem, or I can make a type of weapon that works that way. Thanks a lot, I really appreciate the feedback. It keeps me going. 1. Added an Auto-Sell button. 2. Total gold is now shown on the heroes dialog and the battle dialog, so you know if you've got enough money to buy upgrades. 3. 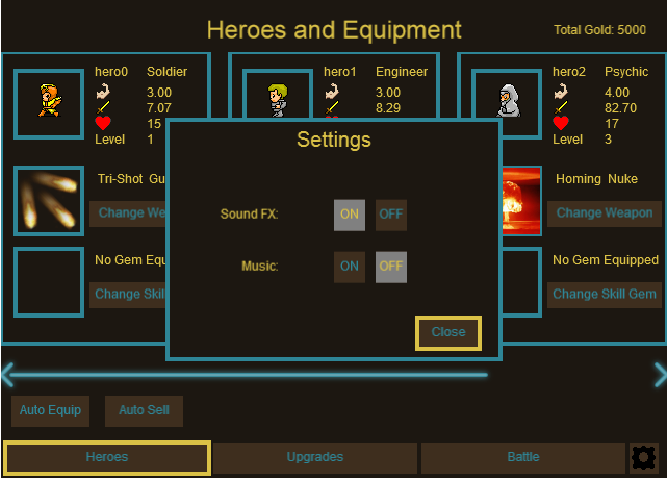 A big change: There's sound effects and music (only during the battle, for now)! I think loading that music and playing it significantly slows down the game until it finishes loading it. I'd like to hear some feedback if that's true. If so, I'll probably have to add a loading screen. Oh yeah and one big (small?) thing is missing: You can't turn off sound while battling. Tomorrow I'll make it so when you press ESC, it pops up the settings dialog. Now potions heal a specific amount of HP instead of a percentage. This is a balancing issue. Using a percentage, I had to start weak and let you upgrade to strong potions. But starting at a weak percentage meant that the health gain was trivial. Now I start at a decent amount of HP gain when you get a potion, but if you don't upgrade your HP gain, the enemies will do more damage and - relative to their damage and your total HP - you'll be getting less health back.